Brazil turned in another effective, but unspectacular, performance last night. That’s five wins in five games, another clean sheet and another win against a big rival. All very good if you prioritise results in friendly matches and defensive solidity. But when your goal is to develop a team that is capable of dominating and beating the best in the world in four years’ time, surely that is the wrong focus to have in friendly matches now? I moan about that and two other things in this post, but end off with a few positive comments. 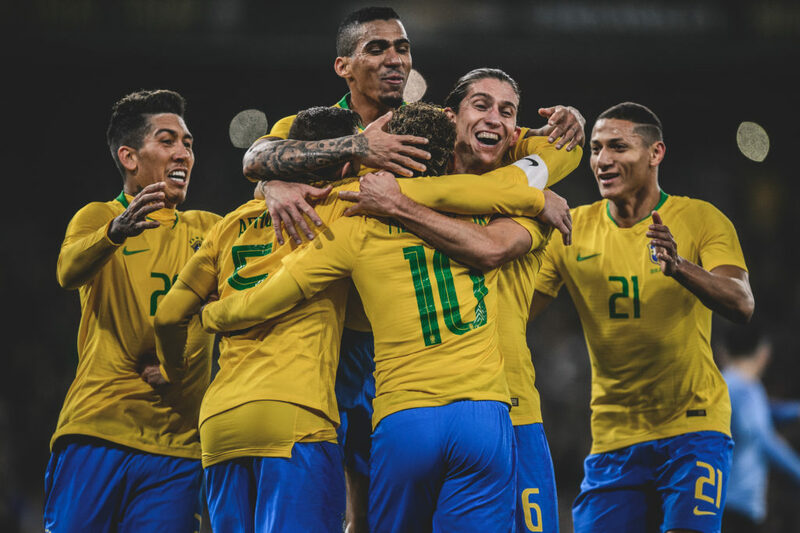 As I outlined yesterday, Brazil’s post World Cup performances and Tite’s team selections have not set the pulse racing. They controlled possession again against Uruguay last night, but most of it wasn’t very effective and they only had four shots on target all night, including the winning penalty from Neymar (which was dubiously given). 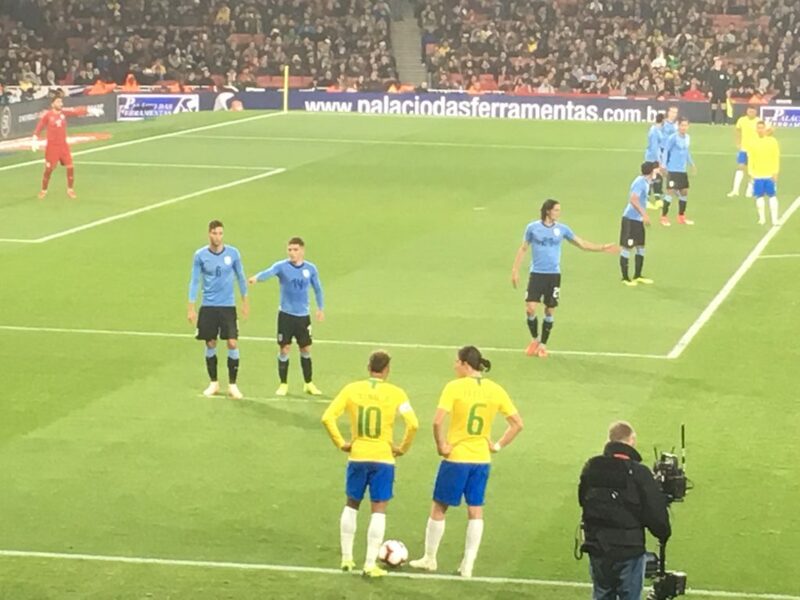 Brazil’s main plan of attack seems to be to give the ball to Neymar and hope that he creates something out of nothing. He does that quite a lot to be fair. But a more dynamic approach, involving the rest of the team, would be a better plan, surely. 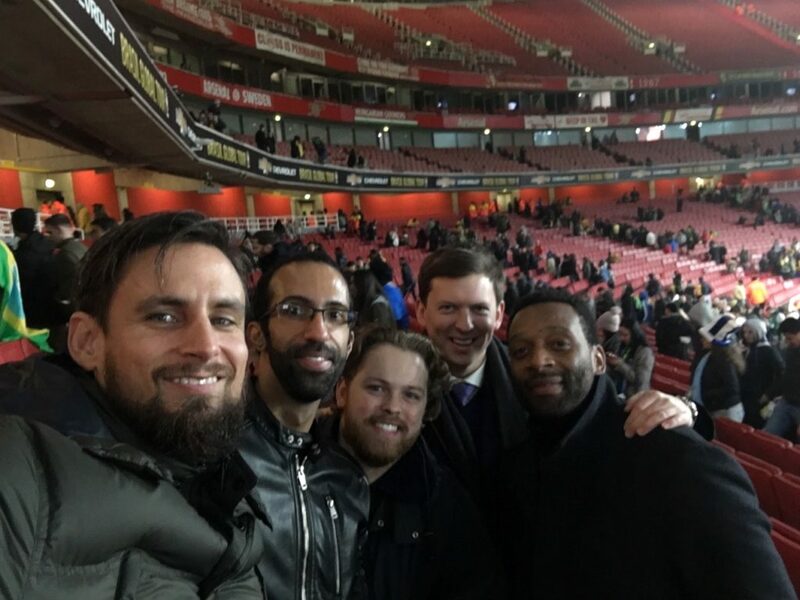 I have three main gripes after watching yesterday’s match live at the drizzle-swept Emirates Stadium. Gripe #1: Relax the focus on defensive shape. Keeping clean sheets and having a good defensive shape is important. But when you have attacking talent like Brazil does, the best way to win a World Cup is to perfect your attacking play. Manchester City keep clean sheets, not due to their focus on defensive organisation, but because they attack teams non-stop for 90 minutes. It isn’t just the players either: Fernandinho is sensational for City, but he cannot get a game for Brazil. My other gripe about about the defensive focus now is that in four years’ time in Qatar, at least two, probably three, of last night’s back four will not be playing. Miranda is 34 years old and I rate him very highly, but he won’t be playing for the Seleção when he is 38. Filipe Luis is 33 and won’t be around in Qatar either. Danilo will be a squad player at best. Tite needs to start thinking further ahead with his defensive personnel. Gripe #2: Why persist with Renato Augusto? Renato Augusto might have an excellent record playing in China – with 10 goals and 13 assists in 26 matches this year – but excelling in China is one thing; starting for the best national team in the world is something else. Renato Augusto just isn’t up to the required standard. Plus he is 30 years’ old – not one for the future. Last night he gave away fouls, lost most 50/50 challenges and didn’t bring anything to the attack. He was replaced by Allan in the second half, which improved Brazil’s play. Gripe #3: Could some people just shut up during the minute silence. It’s not in Brazilian sporting culture to observe a minute’s silence before a match. But it would have been nice if some of the idiots that were shouting yesterday could have kept their mouths shut for one minute and pay their respects to Aldyr Schlee, the man who invented Brazil’s famous yellow shirt, and who died this week, aged 83. There were plenty of shhhhs, which worked a little bit, but in the end people from either end of the ground kept shouting as loud as they could. The ref blew the whistle well short of a minute to end the embarrassment. Positive thing #1: Richarlison’s performance and general conduct. Richarlison made another impressive performance for Brazil last night after coming on for Douglas Costa on Brazil’s right wing. He could have scored after being played in by a beautiful ball from Neymar. But even though he didn’t, his pace and direct running made an impact and caused Uruguay lots of problems. He is starting to make a name for himself, and not just among Evertonians. Neymar and Tite both praised him in the build up to the game. And his entrance onto the field was very enthusiastically welcomed by a group of fans in front of me. A group of Evertonians perhaps? Lovers of the pigeon dance? Fans of Fluminense or America Mineiro, the teams that helped develop him into the player he is today? Whoever they were, Richarlison made a big effort to mingle with the fans after the game, like he does for Everton every week. Top player and a top guy. Positive thing #2: Brazilian clubs well represented in London. Positive thing #3: watching Neymar live and in full flow. Whatever you think of him, if you love football, you have to enjoy seeing Neymar live in action. He gets a superstars welcome whenever he takes a corner or does some gesture to the crowd. He gets people off their seats with his tricky skills. And the kids in front of me were literally screaming when he had the ball. He makes stuff happen and the speed at which he can do things is so impressive. A dive, couple of tumbles on the ground and an exchange of words with Edinson Cavani, right in front of us, was an added bonus. This entry was posted in Seleção and tagged Emirates Stadium, Neymar, Richarlison, Uruguay by Brian Davidson. Bookmark the permalink. Yeah. No longer just the usual carping from Brazil fans about style of play. Tunisia and Japan both scored twice against Belgium in the World Cup. The Selecao has conceded sketchy goals in 6 of its last 7 WC quarterfinals and you just have to plan for it. And, going to Qatar, Brazil will not have won a WC final outright in over 50 years while deploying a 2 center back formation so have to at least consider being more flexible than Tite has shown himself. Also, why call Paulinho and Renato Augusto and not Oscar when he is the best player in China, still only 27, made the 2014 all-WC team and Coutinho isn’t even playing?